Now admittedly, only getting one review code for this will make the review read a lot different to what you may have read elsewhere. Simply put, this game is something that will be much more enjoyable when loading it up with a bunch of online buddies you game with on a regular basis. While jumping in with randoms still made for an okay experience, it was instantly noticeable that playing this with a bunch of regular shooting buddies would take it this game from an alright to loads of fun. That and randoms tend to not have your back as much as mates would in games like this. Teamwork is a much better thing to have rather than a bunch of people welding doors behind your back is what I'm saying. 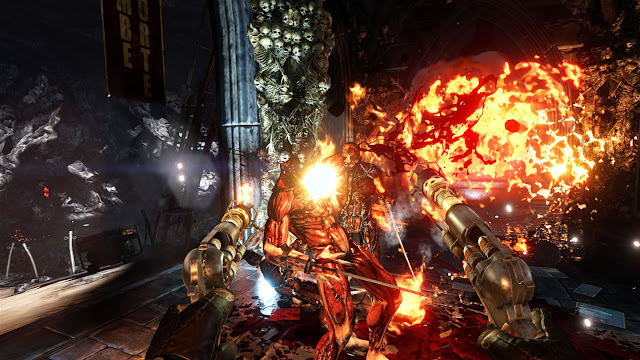 Killing Floor 2 isn't something that really needs a lot of explaining in all honesty, with the pull of the game being either alone or with a bunch of online players, you have the task of wiping out waves of enemies all wanting to kill you. 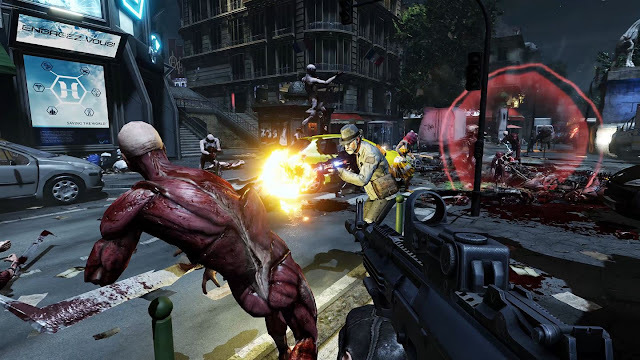 The Horzine Corporation is to blame after having some failed experiments, and it's down to civilians, soldiers, and mercenaries who have come together to fight this mutant (which the game call Zed) outbreaks. Players are sent into Zed filled hot zones to kill all threats using whatever means they can (read that as melee, guns, grenades), with victory and kills bringing XP and goodies at the end if your team survive. The game offers survival mode and a weekly (survival mode with a unique twist to it) mode in solo offline play. Online play offers the above modes with the addition of a vs survival mode as well. This PVP mode offers players the chance of controlling Zeds with some AI controlled ones thrown in for good measure. I would have loved to have written more about this, but the truth is the European region for this when it comes to the server was always dead for me, no matter the time of day I tried. I tried early morning, afternoon, way past midnight for me, still nothing. I even tried a different region, but still no luck. This mode being a bit dead is a worry, but thankfully both normal survival mode and weekly modes have been super active from the day of launch to right now, so no worries there. Each survival match can either be short (4 waves), medium (7 waves), or long (10 waves), which of course get harder the closer you get to the end, with a boss showing up at the end of it too. After each wave in the game you can go to something the game calls a trader pod and restock ammo and health and also buy better guns, or skip any thought of your own here and just simply hold down the B-button to auto-upgrade. Where Killing Floor 2 makes things a tad confusing is the upgrading of your character itself, as for some odd reason they decide to call classes in the game perks. Each of the ten perks (classes) comes with their own starting loadout and skill tree and perk bonuses. Skills unlock at certain ranks, with five being the earliest time you can choose between two options. I played commando and he had the choice of either an increased reload speed or increased magazine capacity of all perk weapons. It's things like this that confused me a little if I'm honest, with me not really caring about any of this and just seeing which of the ten classes I enjoyed playing as the most. You can also mess with how your character looks in the gear tab too. Here you can change his emote, head, body, and finally accessories. The one thing I wasn't best pleased with here was here is where I found the way the game tries to squeeze even more cash out of you via what the game calls supply crates. These locked crates that you can earn require a key, which I'm told are given out within the game (not had one myself yet), but for those not willing to hopefully find one they are being sold for £1.99 on the Xbox store. I just find this loot box craze is getting way out of hand now, and the days of buying a game for £30.00 to £40.00 and not being milked for all spare change you have is happening less and less of late. Overall: If you plan on picking this up with a bunch of friends, then the game will be great fun if you enjoy games such as Left 4 Dead or to a smaller extent games like Destiny with the same online buddies. Working together to survive will see many hours of fun passing with the game offering more than enough maps to keep things fresh for a bit. Single players, on the other hand, will soon find the game becoming dull and be something they only load up for a couple of games before switching off. Much like Destiny, it feels more like a grind once you've shot the same end boss for the fifth time. I'm mostly a single player kinda guy, and needing to play with randoms always ends up annoying me. Your review basically confirmed what I already thought, Looks good but not for me. Good review man and sounds about right. 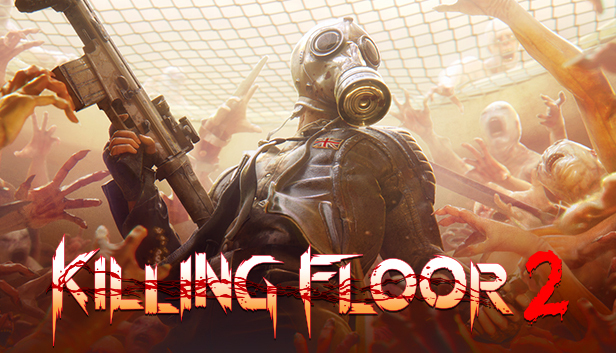 I got the original Killing Floor free on PS+ and had the same feelings about that one. Got board of it quickly and the only reason I gave it ago was because it was part of the PS+ sub.